Η ΔΛ Gallery παρουσιάζει την Παρασκευή 29 Σεπτεμβρίου 2017 την ομαδική έκθεση φωτογραφίας με τίτλο «Local stories» σε επιμέλεια της Νίνας Κασσιανού. Όπως παρατηρεί η Νίνα Κασσιανού τα τελευταία χρόνια ο κόσμος – και μέσα σε αυτόν ο καθένας από εμάς, χωριστά – έχει γνωρίσει μια δραματική και πρωτόγνωρη αλλαγή. Συχνά αισθανόμαστε μετέωροι ακουμπώντας με το ένα πόδι στο «παλιό», γνώριμο, οικείο κόσμο της παιδικής μας ηλικίας, και με το άλλο στον «πλούσιο» παγκοσμιοποιημένο ολιστικό κόσμο του σήμερα. Συμμετέχουν: Δημήτρης Γέρος, Ανδρέας Θεολογίτης, Δημήτρης Κοιλαλούς, Μαρία Μαυροπούλου, Λία Ναλμπαντίδου, Καμίλο Νόλλας, Ρέα Παπαδοπούλου, Χρύσα Τσοβίλη, Έφη Χαλιορή, Virgilio Ferreira, Dominika Gesicka, Ellen Kooi. 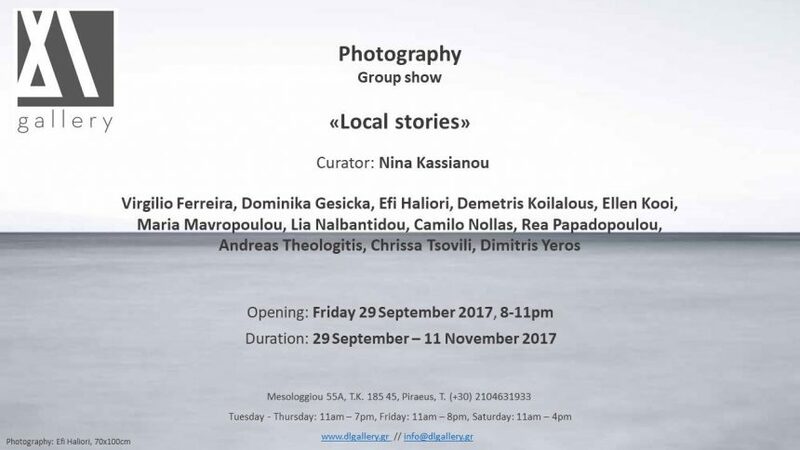 ΔΛ Gallery presents the group exhibition of photography titled «Local stories», curated by Nina Kassianou on Friday 29 September 2017. Lately, as Nina Kassianou notes, the world – and each one of us individually – has experienced a dramatic and unprecedented change. We often find ourselves straddling two worlds – one foot on the “old”, familiar world of our childhood, and the other on the “rich” globalized holistic world of today. Our environment is influenced and shaped by information which creates a picture of everyday life common to all the peoples, wherever they may be, faithfully following the trends and imperatives of a globalized paradigm. Nevertheless, we all live somewhere and that somewhere is a specific place. The school, the kiosk, the pharmacy, the restaurant as well as the people we meet everyday define our local neighbours and are part of this microcosm that surrounds us. However, the rhetoric of globalization overcomes and ignores this locality, even fights it and supports the notion that we live in a world without actual and strong ties with anyone or anything. Globalization is like a blanket that hides the complexity, the multiculturalism and the differences. These are the concepts that this exhibition «Local stories» attempts to highlight arguing that the world we live in has the characteristics and peculiarities of every single place. The world is “local”. In this exhibition the photographers abandon the idea of a “non-place” that globalization implies and turn their attention to a familiar world, to a birthplace in which they often spend all their lives, or to an imaginary place they would love to live in and feel that they belong to, showcasing through personal stories the corners of the earth that they consider “their own”. The photographs are a puzzle of different types and techniques and present a wide range of contemporary photographic expressions. Documentary photography blends with art photography, landscape pictures start a dialogue with portraits in a studio, and photographs developed with modern and complex methods observe with curiosity those reminiscent of a simpler but glorious past. The photographers who exhibit are: Virgilio Ferreira, Dominika Gesicka, Efi Haliori, Demetris Koilalous, Ellen Kooi, Maria Mavropoulou, Lia Nalbantidou, Camilo Nollas, Rea Papadopoulou, Andreas Theologitis, Chrissa Tsovili, Dimitris Yeros.